About one year ago, almost to the day, I made the decision to be more intentional on social media as a means of determining if blogging and putting myself out there on the interwebz was something I was ready to do. 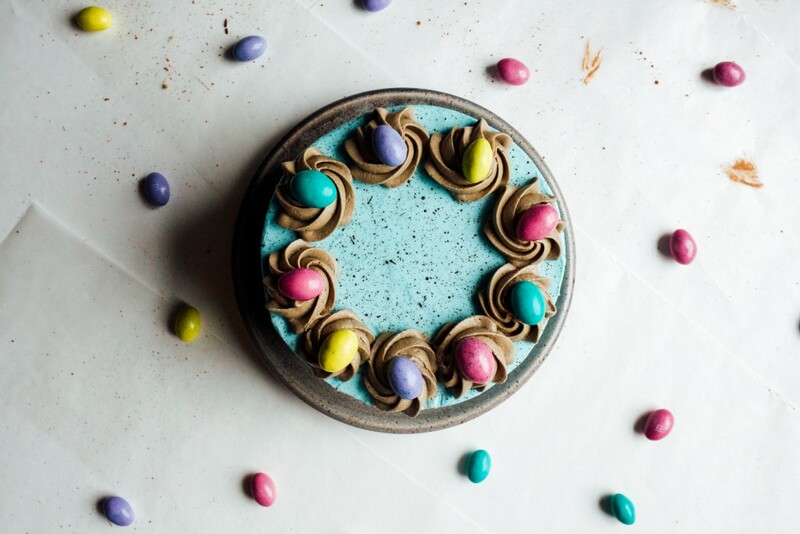 About two weeks into this experiment, I made an Easter cake, speckled to look like a robin’s egg, topped with little nests of swirled chocolate buttercream, and studded with leftover jelly beans from Aimee’s first Easter basket. (Shameless shout out to other moms who buy candy “for their kids” that just so happens to be their own favorite varieties and wind up hiding in the secret, “mom’s only” corner of the pantry. I feel you.) The cake was adorable and because I was pretty excited about it, I posted a photo on Instagram. Imagine my surprise when, hours later, Food and Wine magazine re-posted the photo. MY photo. I found myself victory dancing in the living room, high-fiving my husband, and with a new batch of Insta-followers. To me, that Easter cake was a moment of much needed confirmation that I was to continue forward. Since then, I’ve had a lot of people ask how to make that humble little cake, so in honor of Easter, you’re going to get a fancy little tutorial today. 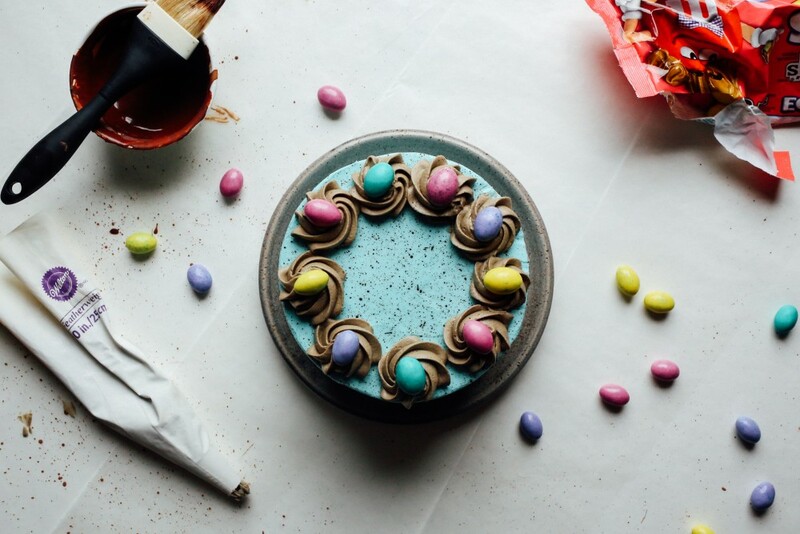 This Easter cake is fairly simple and is a perfect excuse to get messy in the kitchen. 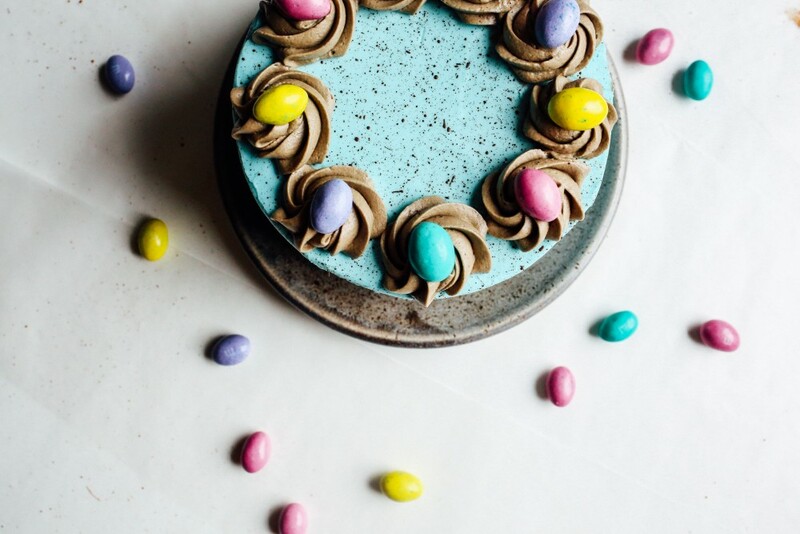 If you have kiddos, or if you just share my affinity for pretending to be artsy in the kitchen while simultaneously stuffing your face with Easter candy, this cake is for you! 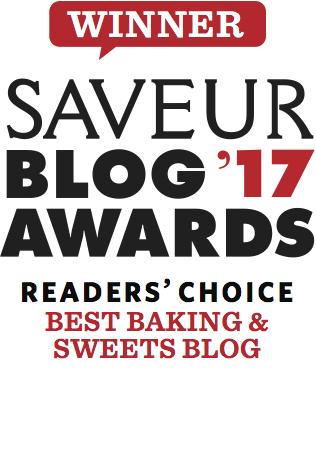 Little ones can help with the speckling and will love the opportunity to sneak a jelly bean or a lick of the frosting bowl. Be warned that this process can get a little messy, so be sure to protect your work space with newspaper, wax paper, or old t-shirts of your husband’s that you secretly want to make disappear. 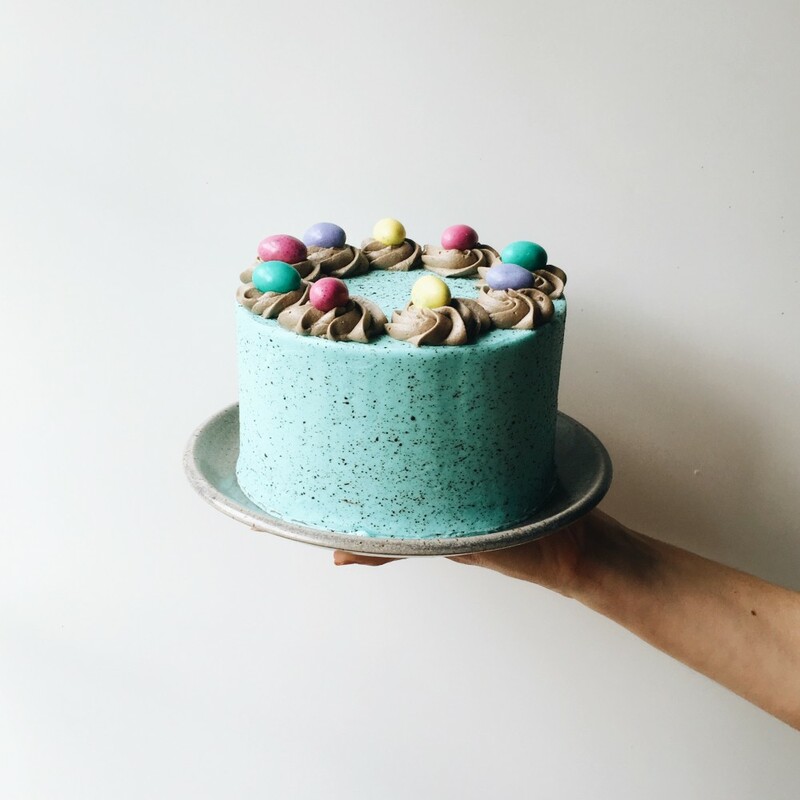 This Easter cake is one I plan to make for years to come and seems like a brilliant tradition to start with my family in the kitchen. My babies aren’t even old enough to say the words “Easter Cake”, but I’m eager to make memories with them on special holidays. If you have any traditions or recipes you like to share with your family during this holiday, I’d love to hear about it below in the comments section! Set aside 1 cup of frosting. 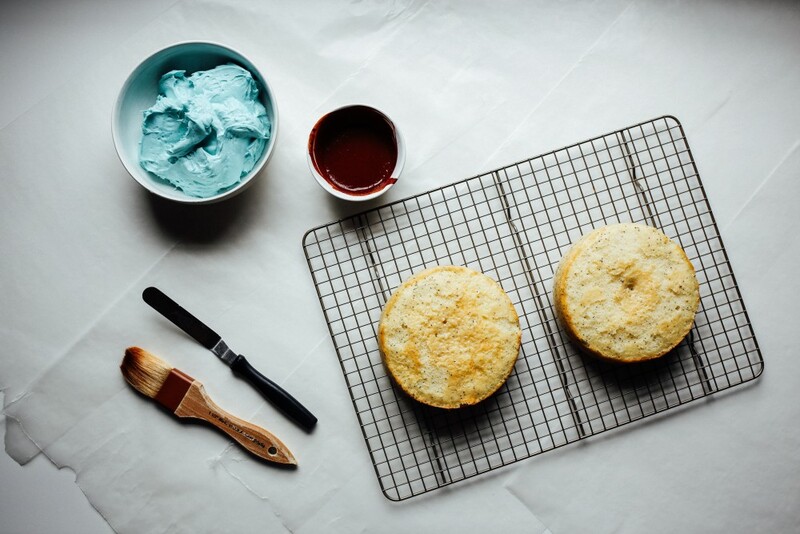 In a bowl, add a small drop of light blue food coloring to the remaining two cups of frosting. A little goes a long way, so add slowly. Once your frosting it too dark, there’s no going back! Also, keep in mind that the frosting will darken as it sets. Fill and frost your cake. I like to smooth my cakes with an off-set spatula like this , but a butter knife will do the trick! In a small bowl, mix together 1 tablespoon of the cocoa powder and the vanilla extract until a thin, watery slurry comes together. Set your unfrosted cake on a clean, covered work surface. Do no speckle close to anything you can’t easily wipe down with a wet rag- things are about to get messy! Hold your paint brush or natural bristle pastry brush at the base of the bristles. Squeeze, applying a small amount of pressure with your fingers to fan the brush slightly. Dip the tips of the brush in the cocoa/vanilla “paint” and find a spare corner of your covered work space to practice your splatter. While continuing to fan your brush with one hand, use the fingers of your other hand to lightly pull back the bristles and release. This will be a slingshot type of movement and will result in a splatter effect on your work surface. 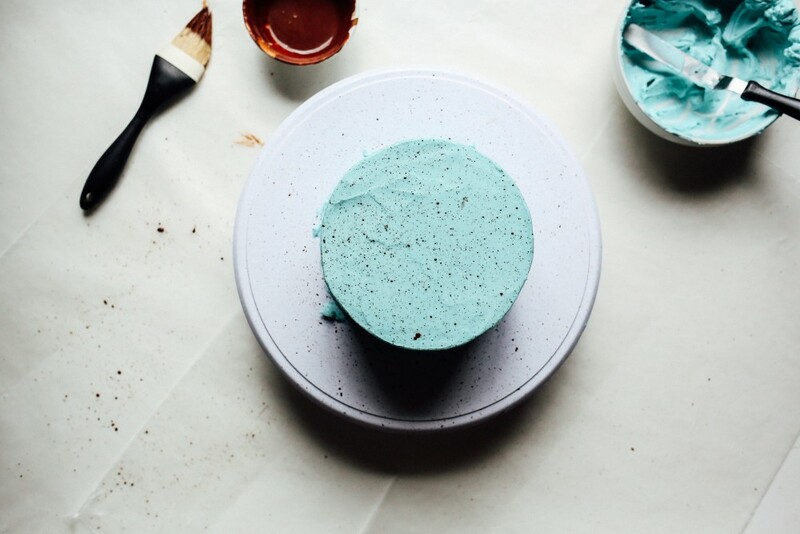 Once you’re confident with your speckling skills, move on to the cake! I start with the sides of the cake and finish with the top. Mix your remaining cup of frosting with the remaining tablespoon of cocoa powder. Add a small amount of water, if needed, until frosting is piping consistency. In my experience, a medium consistency frosting works best here and can best be described as frosting that, when peaked, will droop slightly without collapsing back into the blow. Fill piping bag with this frosting and pipe away! I did simple swirls but you can get as fancy as you’d like. Top each swirl with one piece of candy. 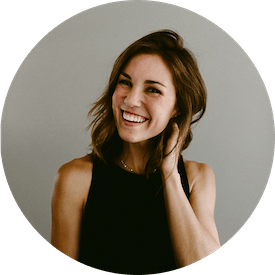 I am so happy that I recently stumbled onto your insta feed, which then brought me to your site. Your work is breathtaking and so inspiring. This cake! Hot damn, it is stunning. Hello! Thank you for the kind words. Excuse me while I go lurk you on insta too 😉 Happy Easter! Thank you for the kindness! I enjoy seeing your goodies all over social media as well. Isn’t it funny how the internet just opens up this incredibly unique and creative world for relationships you’d never ordinarily have?? Happy Easter to you as well! Agh! You totally should. You can do it.